Jet black granite, mostly pitched with polished features. This is one of the more stunning family memorials we have erected in the last 10 years. 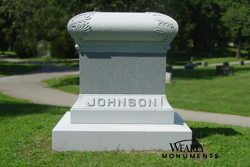 The center die stands 9’ tall and is flanked by two bench seats with pillars. 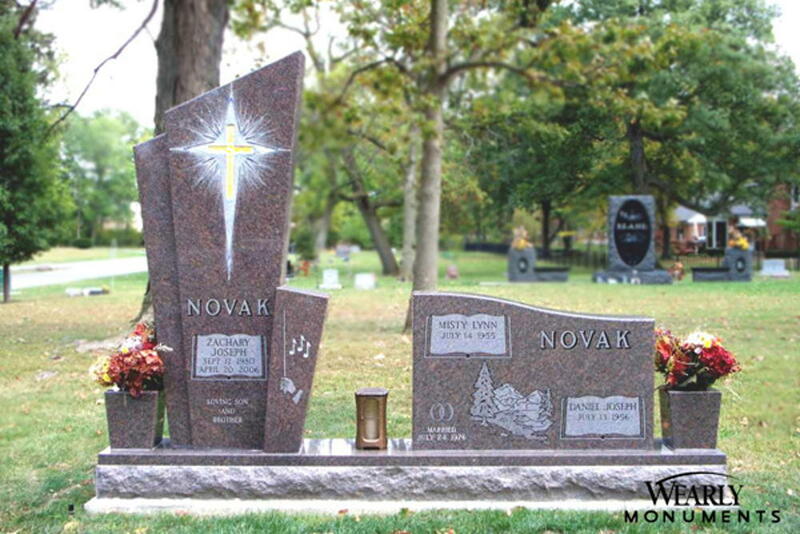 This memorial is saturated with texture and is a wonderful combination of organic pitched stone and highly polished precision cut geometric shapes. The central oval is hand etched with a family tree. All steeled Vermont Gray with Jet Black insert. 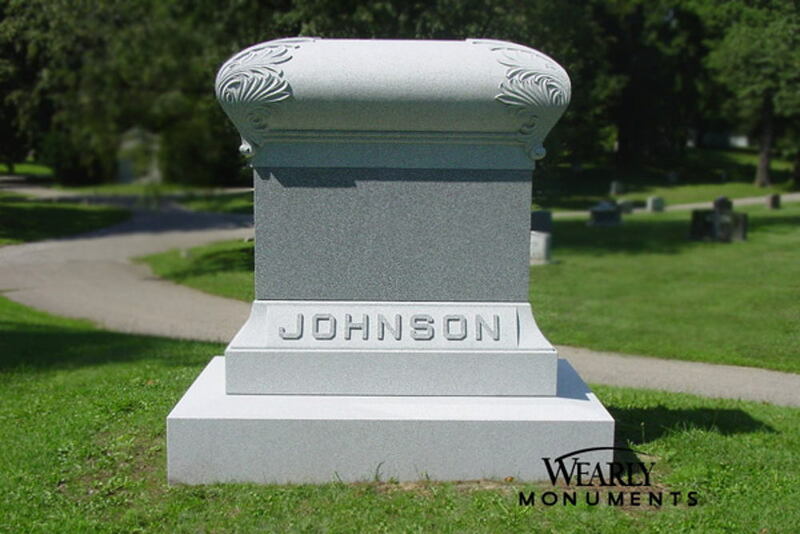 This family memorial has classic proportions and clean lines. 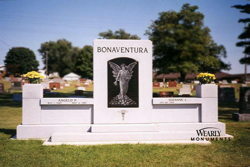 The side wings are capped with bench seats which make this memorial an inviting place to stay a while. The oval top on the insert along with the planters on the end posts help to soften the stark expanse of stone that stretches over 12 feet. Paradiso granite spire. 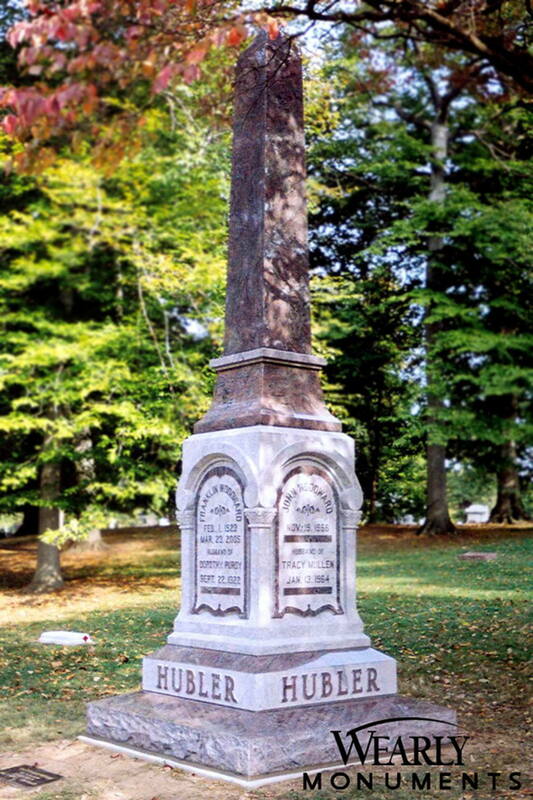 The Hubler memorial is a stunning example of old world style and craftsmanship. 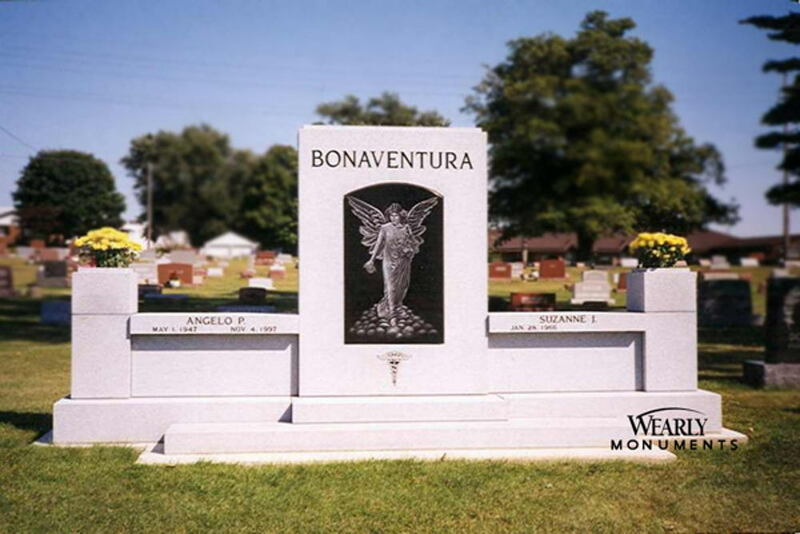 Square raised lettering flanks all four sides of this very elegant family memorial which reaches toward the heavens at 19'. All polished India Red granite with apex top. This is one of the most classic family memorial shapes you will find in North American cemeteries. Even so, the Irving memorial has a contemporary feel to it due to the bright red color, the use of the logo and the continuous chain carving around the plinth or sub-base. 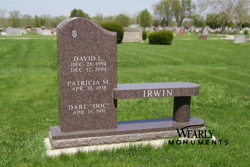 All polished Imperial Brown granite bench memorial. This style is very contemporary with lots of curves. The Irwin memorial makes great use of a tablet and bench combination. 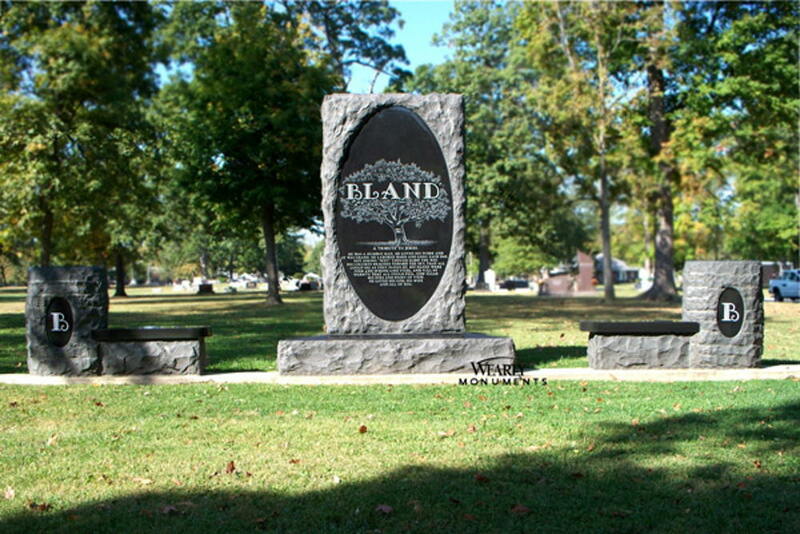 The family opted to use Roman lettering without any decorative elements on this memorial, allowing the shape of the stone to make a statement without distraction. 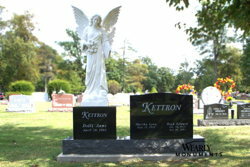 All polished Jet Black granite with 5’ composite marble angel. 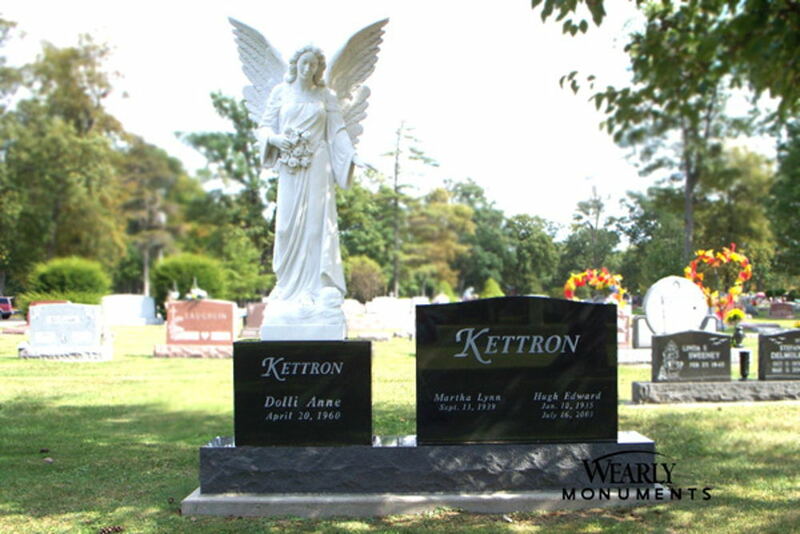 This family memorial is striking in its simplicity, the parents on a double traditional stone and the daughter on a separate stone serving as a pedestal for the angel. All polished Dakota Mahogany granite with asymmetrical shapes. This family faced the tragedy of losing a child and opted to combine a single memorial with a double memorial sharing the same base stone. 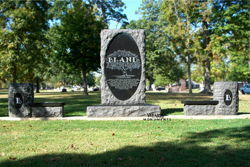 The two stones are distinctly different shapes that are drawn together through the use of the same lettering style and inscription panels. 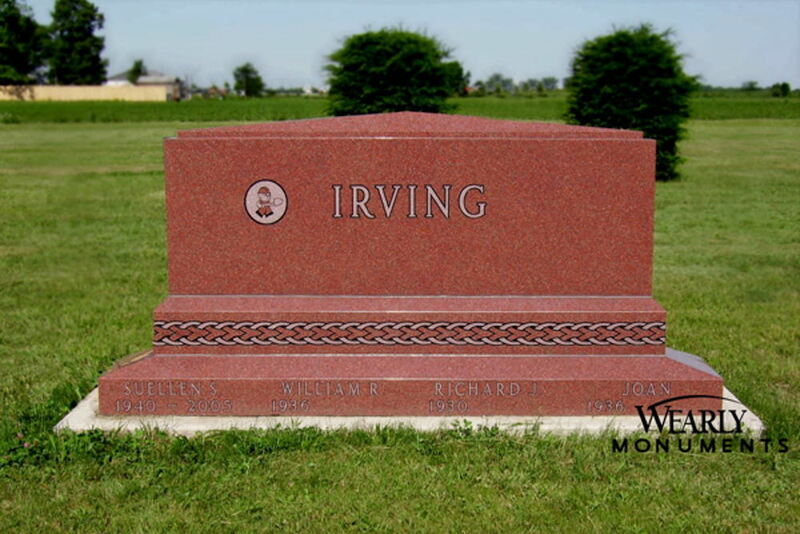 Vermont Gray and Jet Black with granite planters on all four corners. 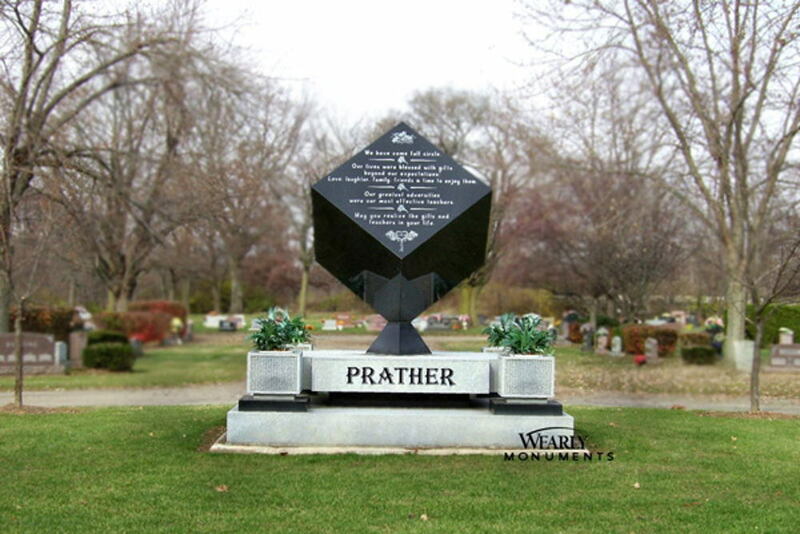 The Prather memorial is a testament to precision in terms of cutting and setting stone. The cube atop this family stone is 5’ and weighs approximately 6 tons. It was one of the more challenging jobs we have erected from a technical standpoint. 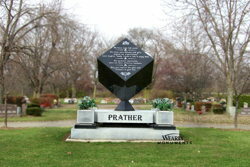 The Prather memorial never stops turning heads. All steeled Georgia Gray wings with all polished Jet Black center. 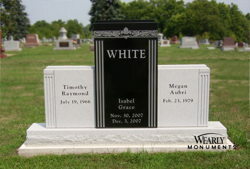 The White monument is a very traditional family memorial with checks at the top and fluted columns on the ends. It is a very clean and classic stone.